Don’t you just hate it when you get your little one’s brand new uniform and a few days later they come back wearing someone else’s old jumper, after picking up the wrong one at school! 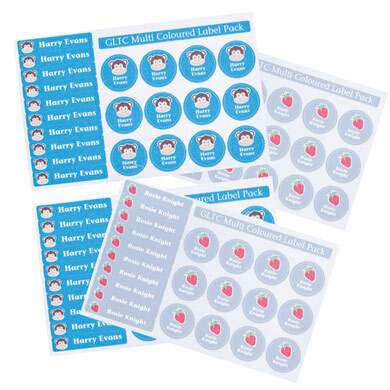 The Great Little Trading Co have just launched 15% off and free delivery on all Name Labels, to help out all the parents preparing for the back to school rush. Their name labels range from iron-on to sew-in and adhesive depending on what you need, in various shapes and sizes. They all come personalised and you can even choose a little motif and colour. The multi-packs are great so you have a mixture of iron on labels, shoe stickers, and adhesive stickers for the unifrom, lunch box, pencil case and shoes! If you’re going on holiday and want to clear customs in style just enter the code TRAVEL if you spend £50 or more at Benefit cosmetics and you get a free passport holder. Remember you get FREE standard shipping automatically when you spend over £40 and 2 free samples with every order.